The purpose here is not to convince you that Turkey should be next on your bucket list; its beauty and impact are profound, though it’s understandable if current events have you postponing any thought of visiting. But let’s not forget that behind the news headlines we too often see, there is a beautiful, culturally-rich nation that lives on through it all. IT WAS A JUNE THURSDAY NIGHT AROUND 9:30, less than an hour since the Ramadan fast had broken for the day. The annual month-long holiday began earlier that week, and my trip to Turkey happened to coincide with this special time of year. 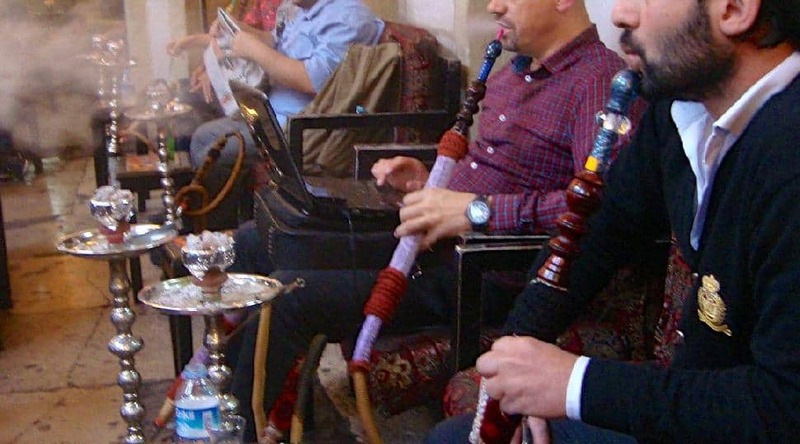 By recommendation of born and raised Turks, I, along with a few of my fellow travellers, found my way to Corlulu Ali Pasa Medresesi, a shisha bar in Istanbul’s Sultanamed area. The vibrant energy would have been considered normal for the locals who packed the place, gathering to smoke in good company, but it was visceral and exciting for me. Tucked away off Yeniçeriler Street, Corlulu is dimly lit, mosaic lanterns hanging from the ceiling, with well-worn benches and tables that rocked on the uneven floor, and the air smelled sweet like cherries. This was the Istanbul I had been craving to experience, and I was beyond excited to be there again. I had proven unsuccessful at smoking the hookah during my first visit to Istanbul a few years prior, and I was determined to redeem myself. I watched as other patrons exhaled clouds of smoke – sometimes artistically, always methodically – but even after careful observation, I failed to mimic the technique of those around me. Ultimately, it didn’t matter; just being there was enough. This place was full of life – full of friendship and human connection – very different from the reality many Westerners might expect to find in a country familiar to us primarily through negative news headlines. 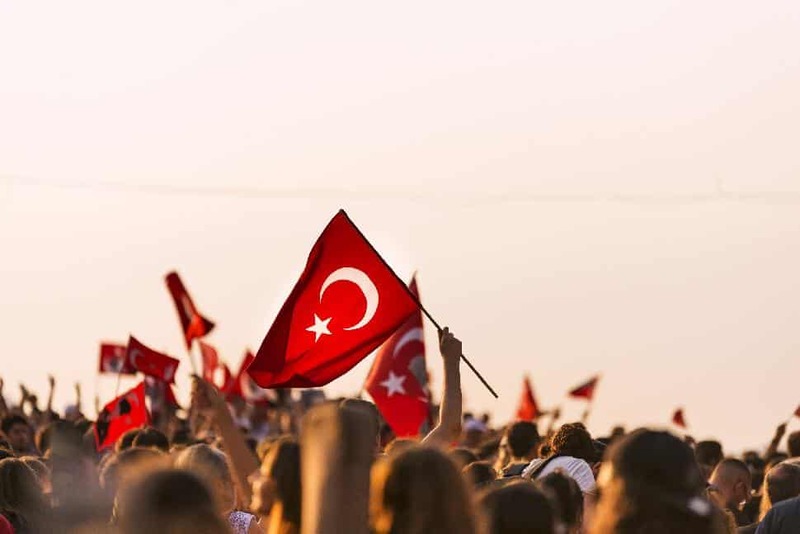 It’s no secret that Turkey has faced its fair share of hardship over the past number of years, which has significantly impacted its appeal as a tourist destination. Last July (not long after I got back from this trip), a bombing shut-down Atatürk Airport, soon followed by an attempted coup, and most recently, there was a tragic shooting at an Istanbul nightclub on New Year’s Eve. This summary is not to downplay the significance of these events or to ignore the ongoing political challenges throughout Turkey, but because these are the stories that we see in our Canadian media, we oft forget to consider the day-to-day human experience that carries on across the country; one which, influenced by fear, many tourists may not be willing to explore for years to come. So, I understand if it's surprising to learn that I was beyond enthused to find myself there, and you might even think my decision to go at all was irresponsible. But sitting in that hookah bar after a day of sightseeing and eating my way across what I consider to be one of the greatest cities in the world, I was reminded that Turkey is beautiful, and alive, and teeming with cultural and historical richness. This theme was evident throughout my trip, during which time I visited Istanbul and the region of Cappadocia. These two destinations are equally captivating though completely unique in terms of appeal, and as such, pair together perfectly. 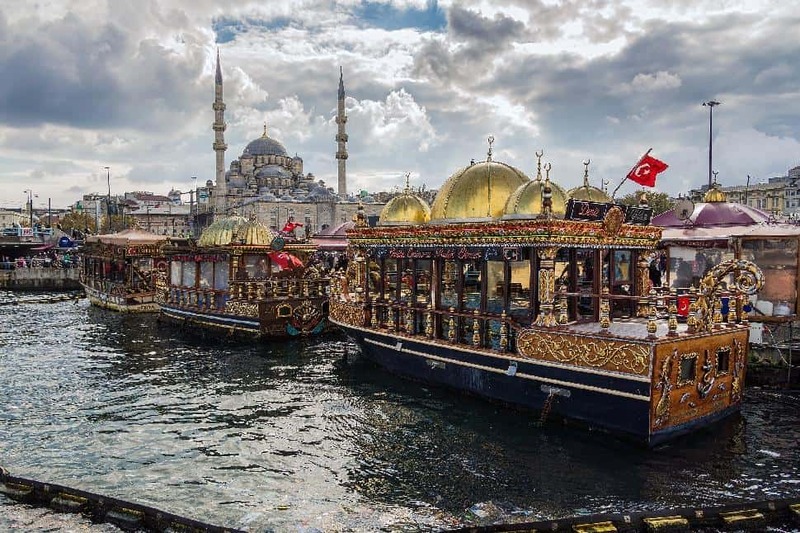 Istanbul – still fondly referred to by some as Constantinople, a city where history dates back as far as the 11th century BC – is an urban mecca. You can’t compare it to New York or Toronto or even Tel Aviv for that matter; Istanbul is in a league of its own. 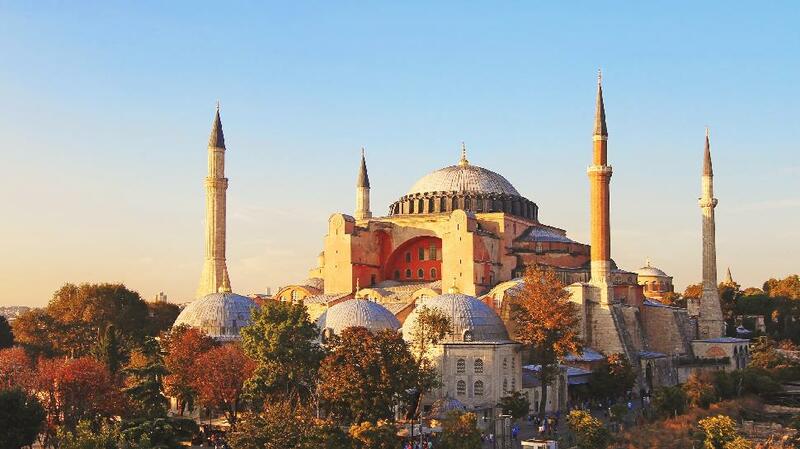 Having begun our trip there, my group and I stayed the typical tourist path, visiting Haiga Sophia, Topkapi Palace and of course, the Blue Mosque. I realized, as I thought back on my first experience in the city, that my memory did not adequately capture the beauty and magnificence of these attractions, none less so than the latter. 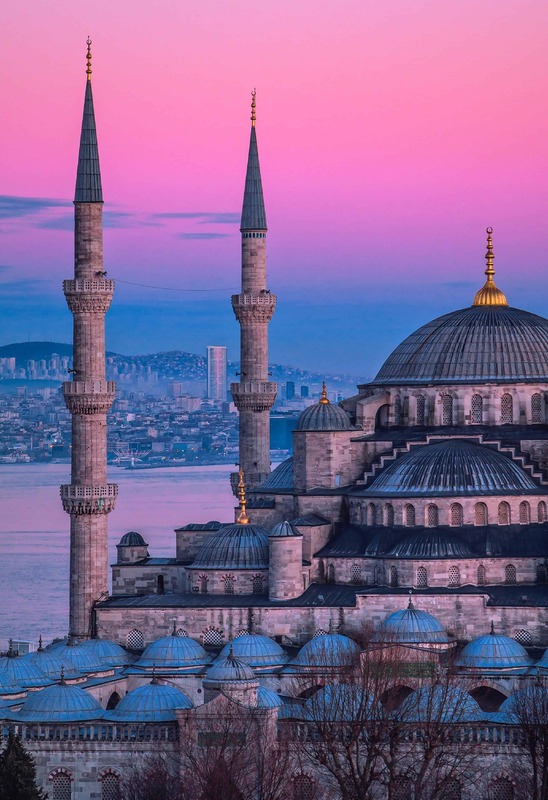 The Blue Mosque (or, Sultan Ahmed) is a sight to behold from the outside, its six minarets being the identifying markers of the Istanbul skyline. But its breathtaking interior is arguably the real draw, with thousands of hand-painted blue tiles adorning its walls, contrasting perfectly with the sharp red carpet atop a floor which an infinite number of sock feet from various faiths have passed over since the 1600s. That’s the thing about Istanbul; there’s something about it that unites people. Christians and Muslims and Jews all come together there, and regardless of beliefs, as the call to prayer routinely echoes throughout the city, those moments are indescribably powerful. Another unifying factor about Istanbul is more literal, in that it is the only city in the world to span across Europe and Asia. I had one day there free from my group, and to make the most of it, I booked a tour with Urban Adventures called “Picnic on Two Continents.” I met my guide Tolga at the entrance of the Spice Bazaar (a must-see when in Istanbul), at which point I was surprised to learn no other tourists would be joining us. A sign of the times, he admitted, though clearly excited to be giving me a local’s taste of the city nonetheless. This exclusive tour took me from vendor to vendor, collecting Turkish delicacies by Tolga’s recommendation. It was another example of why I love Istanbul, specifically, the jovial nature of all the interactions we had along the way. 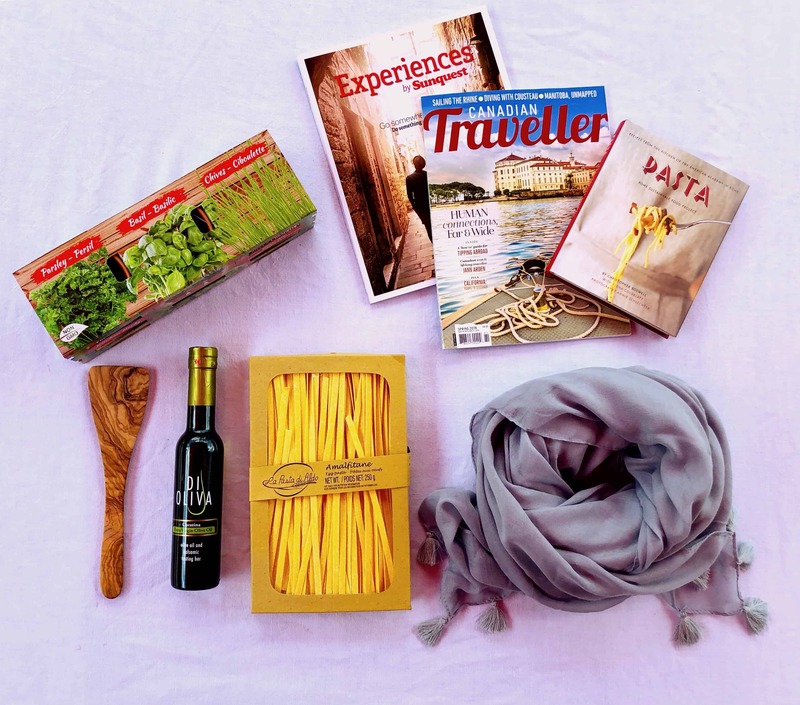 On our stop for olives, Tolga was blushing as he laughed and shook his head during a conversation with the shopkeeper. I couldn’t understand, though Tolga later confirmed my suspicion that the gentleman had thought I was his girlfriend. Truth is, Tolga is married with a young daughter at home, which I learned later in the tour. We crossed the Bosphorous on a ferry and found a café along the water’s edge, where we ordered tea and took out our lunch – a brilliant collection of fresh cheese, eggplant salad, pide bread and baklava, among other things. It was a peaceful and perfect afternoon, as Tolga and I talked about life in Istanbul and his concerns about how the decline in tourism might impact his family, since both he and his wife were employed in the industry. Learning of his love for Turkey and the details of his travels as a tour guide throughout the country and beyond, it was hard for me to understand how people can so quickly rob themselves of the opportunity to enjoy the exact experience I was having in that moment. More profoundly, the simple movement that got us there – from one continent to another, while remaining in the same city – was a reminder that borders truly only exist on maps and in geography books; divides between countries and continents and territories and states are of human construction, just as the barriers often hindering human connection – like the one Tolga and I had that afternoon. 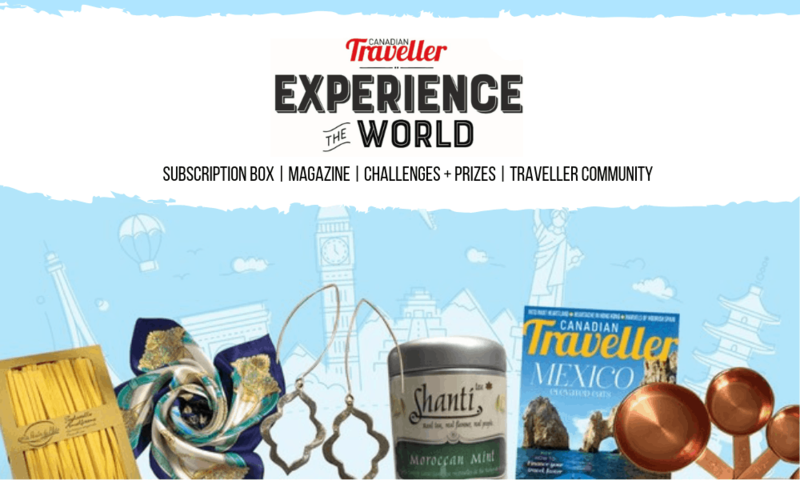 From Istanbul, our journey took us on to Cappadocia, famous for its otherworldly panoramas, consisting of endless rock formations – most notably, fairy chimneys. Located about 800 kilometers south-east of Istanbul (or a 1.5 hour flight), unique topography coupled with an incredible history makes this one of the top choices for travellers to Turkey, where homes and hotels are built as caves into the mountains, and various sites date back to what seems to be the beginning of time. We had the chance to tour Derinkuyu underground city, which reaches depths of up to 60 meters and dates back to at least the 7th century BC. The intricate design of the underground city was meant to protect its residents – of which there were apparently up to 20,000 – during times of war, so each level could be closed off separately from the one above. 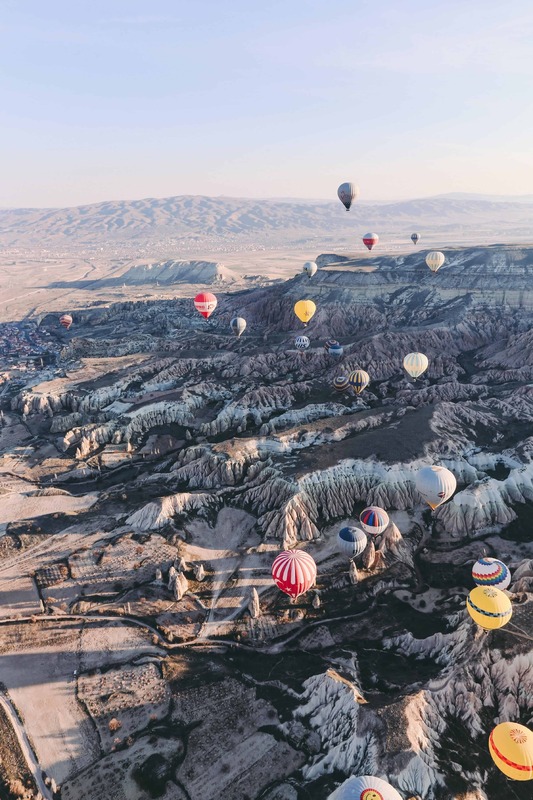 Exploring further into the different regions of Cappadocia, we saw rockcut churches and the Göreme Open-Air Museum, and while all are magnificent, nothing beats seeing this region from the sky. In fact, hot air ballooning is a driving factor for visitation – you’d be hard pressed to find a tourist there who didn’t have a flight in their plans. Suat Ulusoy of Royal Balloon was the chief pilot who guided my group above Cappadocia, which allowed us to watch the sun rise over the Rose Valley (Güllüdere Vadısı). The basket was big enough to hold about 12 of us, and as we sailed with the breeze through the open sky, we were silent for a while. The magic of the moment – light coming up over the horizon, beautiful vistas in any direction and dozens of other balloons floating alongside us – was not lost on anyone. This stillness of Cappadocia contrasts well with the hustle and bustle of Istanbul but whether you’re touring age-old cave churches or bartering at the Grand Bazaar, Turkey will find its way into your blood. Which is why that visit to Corlulu was so special, a close walk from whatever local restaurant we found ourselves indulging in beforehand. I look back on that night and wonder about the people who sat next to me, across from me – those who were entertained by my failed attempts at doing a proper puff. I wonder if the air is as smoky and the tables as crowded. I wonder if the conversation as jubilant and the atmosphere as carefree. I think of Istanbul fondly as my “happy place” and my hope is not only that more Canadian visitors will eventually experience why, but that those who call it home can say the same. Turkish Airlines flies six-times weekly from Toronto to Istanbul. For those interested in venturing further, the airline connects to 293 destinations from its hub. Flights to Cappadocia, specifically ASR (Kayseri) airport, are available from IST (Ataturk Airport) and SAW (New Istanbul Airport) eight times daily. 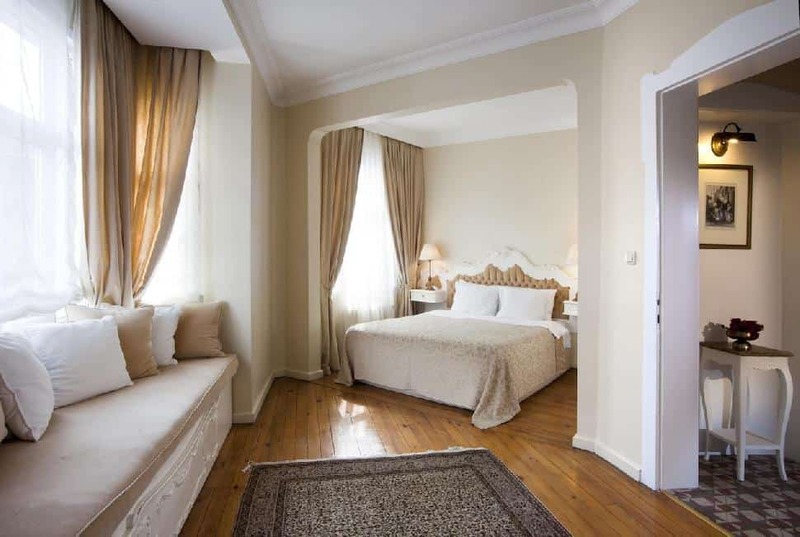 Istanbul’s Hotel Sari Konak is a boutique property with only 23 uniquely appointed rooms, and located a short walk away from Hagia Sophia, the Blue Mosque and Topkapi Palace. A plethora of dining options are within arm’s reach, but if you just need time to relax, its rooftop terrace provides panoramic views of the Sea of Marmara on one side and the Blue Mosque on the other. When you find yourself in Cappadocia, treat yourself to some time at Kayakapi Premium Caves, a luxury cave boutique hotel with upscale amenities and panoramic views overlooking Ürgüp. A large swimming pool made from glass mosaic tiles is the centrepiece of the property, and guests can choose to dine at Maide Restaurant, Bistro Manzara or in their own private cave (i.e. their room) thanks to 24-hour room service. If the walk from one area of the property to another seems daunting, shuttle service is available via golf carts, but we recommend treading the path at low-speed and absorbing the beauty as often as you can. 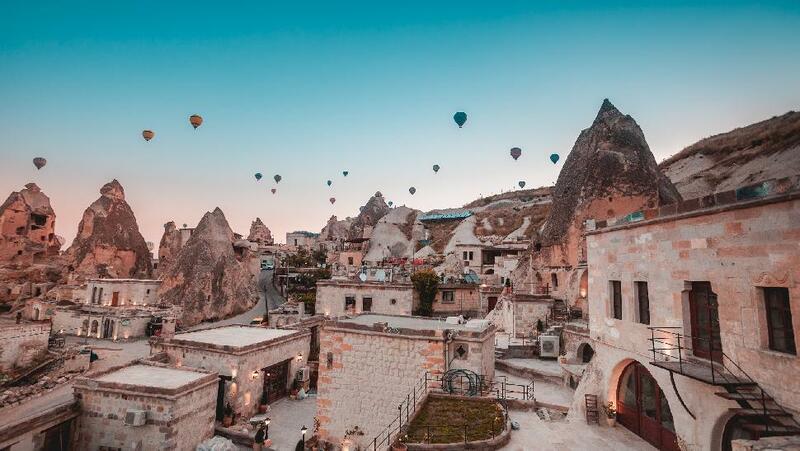 You’ve seen the iconic images of hot air balloons floating well above fairy chimneys as the sun rises over Cappadocia – it’s an absolute necessity for any visit to the area. Book your flight with Royal Balloon for great customer service and experienced pilots. End your tour with strawberries and Kayakapi Premium Caves champagne, toasting to another bucket list item now checked-off. 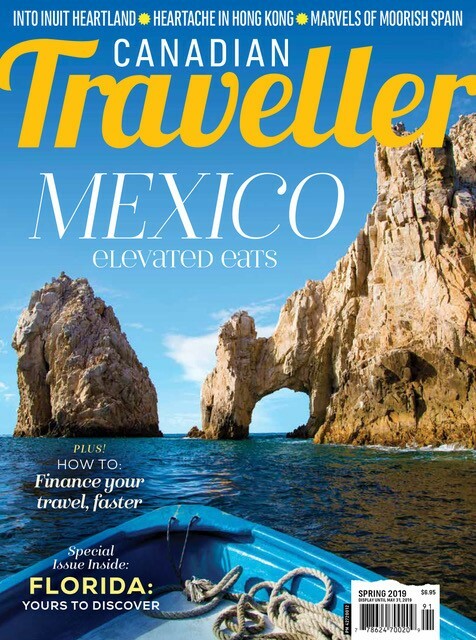 This article originally published in the spring 2017 issue of Canadian Traveller.